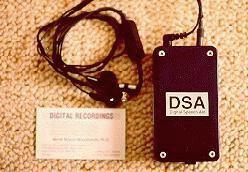 DSA (Digital Speech Aid) was invented by Dr. Marek Roland-Mieszkowski, Digital Recordings and Dr. Andrzej Czyzewski, Technical University of Gdansk. 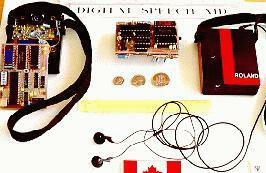 The 1st generation prototype of DSA (the middle device on the picture on the left) was created in March 1992, with the 2nd generation prototype (right and left side of the picture on the left) being developed in May 1992. The 2nd generation model is an improvement from the 1st generation model in terms of electronics and programming with the most recent, 3rd generation model (the picture on the right), being the most advanced and the smallest (11cm x 6cm x 3cm) of them all. The 3rd generation model was developed in August 1993. Work on further improvements to DSA has already started. 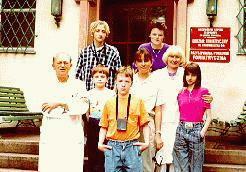 On the left are a speech pathologist, a medical doctor, and some of the patients participating in the first clinical testing of DSA (2nd generation model) that took place in the Speech Pathology Clinic in Poland in the summer of 1992. Most of the tests were performed in real-life situations: in the office, at home, on the telephone, during public meetings, presentations, and good or bad days. On the right, two patients during text reading (using 2nd generation model). 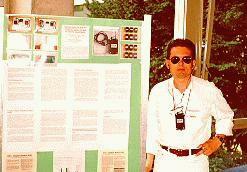 The 3rd generation model was tested in 1993-1994 in Canada, Poland and England. 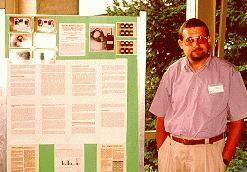 DSA inventors, Dr. Marek Roland-Mieszkowski (left) and Dr. Andrzej Czyzewski (right), presenting DSA at a poster session during the 1st World Congress on Fluency Disorders in Munich, Germany, in August, 1994. They presented two papers at the conference: "DSA (Digital Speech Aid) - a New Device to Decrease or Eliminate Stuttering" and "Digital Speech Aid to Decrease Stuttering - Clinical Results and Patient's Reactions".